This page will contain thermal datasets available for download. Please cite: R. Gade, A. Jørgensen and T.B. Moeslund: Long-term Occupancy Analysis using Graph-Based Optimisation in Thermal Imagery. IEEE Conference on Computer Vision and Pattern Recognition 2013. Resolution: 1920*480 pixels (stitched from three cameras). Thermal sensors: AXIS Q1922, uncooled micro bolometer 8-14 μm, 10mm focal length. ROI: People inside the red line illustrated below are counted. Corner coordinates: (26,306) (485,81) (656,41) (1292,60) (1497,110) (1902,295) (1392,479) (359,479). Annotation: Can be downloaded here. The format is [timestamp] [number of people inside ROI]. 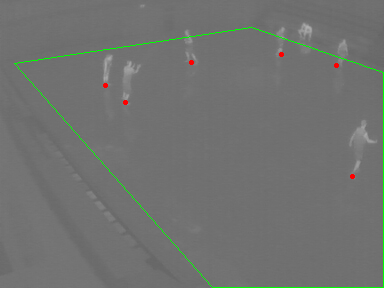 This dataset contains a ~16 minutes of video (30,000 frames) recorded in a sports arena. Every person inside the court area is annotated. 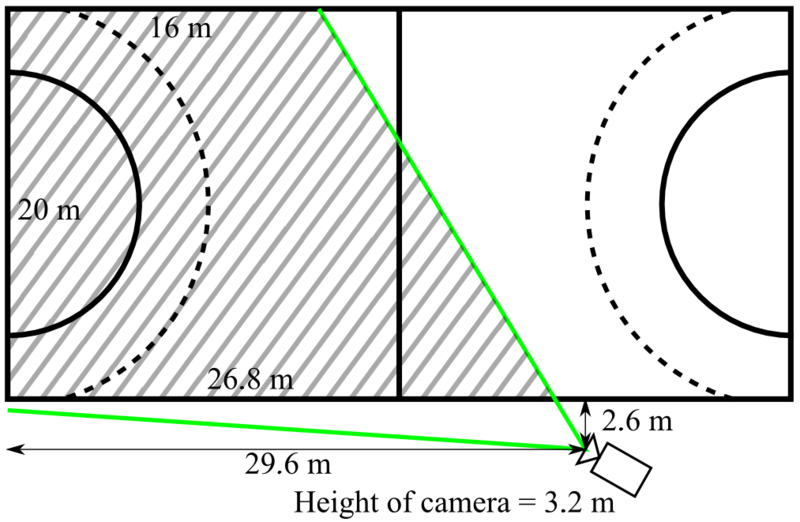 The Image below shows the camera placement and the visible part of the court. The image below show an example of an annotated frame. The red dots mark the persons position on the court and the green line indicates the border of the court. With the text files comes also a file named court.txt that contains the corners for the court in image coordinates and a file named homography.txt that contains a homopgraphy to calculate the world coordinates of the persons. (0,0) is in the lower left corner of the court seen in the first picture. The original images can be downloaded here. The text files can be downloaded here. The annotated images can be downloaded here.